ANDREW BALIO: Among America’s music schools, Rice University’s Shepard School of Music is one of the standouts, up there with Curtis, Yale, and Julliard. And both Julliard’s and Yale’s areas of greatest growth are in the sphere of early and sacred music, a remarkable investment in looking back in to our distant past and traditions. It’s interesting how classical music is actually growing in this sense: we’re rediscovering all this repertoire that deserves our reconsideration. Mr. Greenberg, what sort of music do you attend? ALLAN GREENBERG: I love music. As a teenager, I was fascinated by the different interpretations that two conductors, equally eminent, could bring to the same piece of music. I would collect six or eight versions of the same symphony or concerto or opera and just sit and compare them for hours, trying to understand the nuances, and I’d follow with a pocket score. I went through the usual changes of mind as your comprehension grows, but I always had a special preference for opera. I was taken to see Rigoletto with Tito Gobbi, who came to South Africa with some Italian company. I was nine or ten and I was mesmerized by the spectacle, by the arias and their beauty, by the characters. I just loved that world. The first time I went to Europe – when I was nineteen – I heard Otto Klemperer conduct all nine Beethoven symphonies. At the time he was my favorite conductor, and I sat through all of them. I heard a number of them by Bruno Walter and the young Italian conductor who used to conduct the Philharmonia in London and I loved the human voice. It became my instrument of focus, particularly the female voice in Mozart. When I was in London I saw a lot of opera, but I thought, of all opera, Mozart was the beginning and in many ways the end. He encompassed the whole world. He could do comedy, he could do tragedy, he could do farce, with profundity. He made opera fun. You laugh even when you don’t understand the Italian. It was said that after the premiere of Don Giovanni the little boys who were delivering milk the next morning were whistling his tunes in Prague. Off and on, my musical interest has been opera. My tastes have become really quite broad, but it’s still opera that I love. So when I got the job to design this opera house, it was like a dream come true. And the fact that they wanted a 600-seat opera house – the same size as in Mozart’s time – was perfect. I think there is a limit to the size of an opera house, or there should be a limit. I think the Met with 3,200 seats is stupid. The stage is so gigantic, even for Wagner – a lot of parts of The Ring have three people singing on the stage, and they’re lost. I don’t know what the correct size is for an opera house, but I think it’s around 1,500 people. AB: That’s the optimal size for a concert hall too. That seems to be the sweet spot for acoustics, if you ask an acoustician, someone like Yasuhisa Toyota. AG: For me, great opera – the work itself – is a miracle because you are taking two elements that are totally incompatible – the libretto (the story which takes time to evolve – drama needs time to evolve), and music – and you marry them. One note, just a change of key, and you’re in a different mood, from sad to happy, happy to sad, somber to elated. So you have this sort of thing that goes on and on. The marriage is accomplished through the genius of the composer, and the medium is the human voice. I don’t think there’s anything harder to write in music than an opera. I have always felt a kinship with architecture because in architecture you have form, which grows in your brain, and then the function – 250-square-foot kitchen, three bedrooms of 80-square-footage or whatever – and it is very clinical. Relationships between these elements are pretty straightforward, and you can write them all down, but how do you make a great building out of that porridge? It’s like making an opera out of incompatible elements. Form has imagination, functional organization – it’s fairly rational. So, I’m a really happy camper designing this building. AB: You also did a humanities building for Rice a decade ago, a similar type of commission. They wanted more traditional architecture. Can you talk about that a bit? Usually universities have the idea of the future that they want to be part of, and they consider architecture as a big way of being perceived to be on this cutting edge, as embodying these notions of progress. Interestingly enough, Rice is embracing traditional architecture, overall. AG: When I did my first building at Rice – I started in about 1997 or ’98, and the building was finished in 2000 – the president was deeply involved in choosing architects and the character of the campus. The president, like the trustees, was very conservative. He loved the old campus and wanted to continue it. His point of view was very straightforward: This is a university. The order projected by its campus is in fact the best reflection of the university’s character. A campus should reflect the character of the institution, and they designed their building on the notion of continuity: that this is an institution that has operated with changes but without any breaks, without any reduced focus on scholarship, on truth and justice, and on all the other verities that are part of the study of a university. That has changed. The university since then has tried to be more, has shown broader tastes, and has a greater interest in having modern buildings on their campus. I was excused from that because the trustees decided they wanted to have a hand in choosing the architect for this opera house. So they walked around the campus and settled on the two buildings they liked the most and interviewed two architects. I was one of them, and I got the job. But there is a lot of tension on campus about what character new buildings should have. They’ve tried very hard to keep the same materials, control the heights. It’s a very, very pretty campus although there are some not-great buildings on it, but even those are not as bad as they could be, looking around at other campuses. AB: Before designing this opera house, you’d been attending operas and concerts as a music lover. Had you been designing opera houses in your imagination? AG: No. Wanting something and not getting it can be really disappointing, so I never allow myself to think about a particular project until I sign a contract. You have to do that, otherwise it can be disappointing. AB: So you came into this project prima facie. Did you give a proposal for it before being chosen? AG: They asked me how I would go about designing this building, what did I think were the key aspects of the problem. I talked about the need: the fact that the campus serves as a mirror of the university’s self-image and of the image it wants to project to the public, and I thought continuity is really important in this. I cited Oxford, Cambridge, Harvard – the old campus at Harvard – and Yale, and I think they agreed with that. I also talked about the need to listen to your client: that an architect needs to understand that most clients come to the architect with a dream – a dream of an opera house, a dream of a home, a dream of something new where wonderful things will happen, where family will be more cohesive, where the quality of family life will improve. This opera house will hopefully be part of a major rebirth of interest in opera in this country. We try very hard to do that because all our work comes by word of mouth. Most architecture magazines won’t publish classical buildings, so word of mouth is really important. We strive to leave a trail of happy clients behind us. I talked about that and about the need to listen because the qualities – the constituent ingredients of dreams – are not easy to formulate and understand. I need my clients to think of what it is they want and whether or not what I’m doing actually does that for them. We’ve done lots of drawings and 3D renderings, and eventually there’ll be models. So hopefully this will work for the client. I try to explain to them the fact that an opera is this miracle: between your daily life and the moment you pull up and park your car and get out and walk to the opera house you are experiencing the same thing Alice in Wonderland experienced when she fell down the rabbit hole, going from one world to another world, from a world of reality to the fantasy world of the Queen of Hearts. Jack did the same thing climbing the beanstalk – from life on earth to this miraculous realm in the sky where he had to defeat the giant. So the building has to serve as an architectural overture to the opera. It has to get your mind prepared for this. The opera house at Rice has a certain character that both relates it to and separates it from the rest of the campus. At the far end of the campus, the east side, you have an entry gate and the oldest building on the campus, and as you go straight all the way down the main access you eventually end at the opera house. It’s a great position. As you approach the building you realize that this is not quite the same as the other buildings at Rice, and when you open the doors you’re in this large, barrel-vaulted, top-lit space with coffers and light streaming down. It’s a big space. 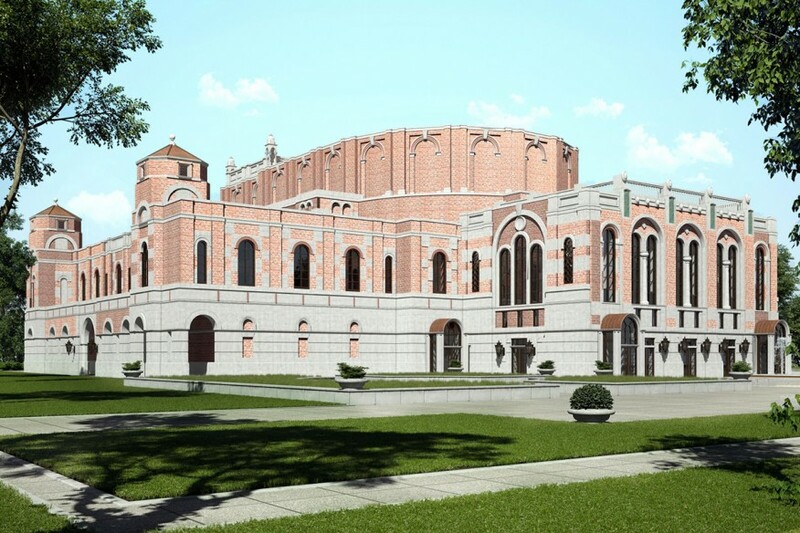 The university is going to use it for fund-raising dinners, small concerts, different events – someone could lecture in it while people are dining. There are many uses for this foyer. Then you go up a major staircase that splits in half – and you go up different levels through different staircases. Each level changes in character and in height and in color. When you open the first doors into the opera house you’re in a realm of unusually bright and vibrant colors, colors you don’t normally see in the world around you: bright reds, yellows, blues, et cetera. All but one balcony level has a view back into this hallway, this big entry lobby. To get from the entry lobby to the opera house itself you have to go through a sound-and-light box, which prepares you. These transitional spaces are all treated differently on each side, so the outside is always different from the inside. You always know where you are, you always come out and see the pattern – it was this way on one side, now it’s that way on the other side – so you know that’s the way out. These spaces wander a little bit. That was sort of intentional, but I wanted it a little more ordered than it is. We had to cut the budget at some point so we squeezed the spaces. They’re a little higgledy-piggledy, but it’s okay. They’re quite tight, so you go through these things and feel compressed and want to get out and then you get to the end of the sound-and-light box, you open the doors, and you’re in the opera house. This is modeled on the little opera house in the palace at Versailles, by Ange-Jacques Gabriel, France’s greatest architect. I was interested in it because it’s made of wood, and from the time it opened, everybody who heard opera in it remarked on the quality of the acoustics. It’s a beautiful space because normally the horseshoe-shaped balconies sit one on top of another, sort of a vertical wall of balconies. Here they get bigger as they go out, so the space is expansive and opens out, so the higher you get the more air you have and the better the view of the stage. So it’s really exciting, doing this. AB: It sounds wonderful. You mentioned that a building can either relate to what’s there or it can stand out. What do you think is the right balance for a cultural institution? Orchestra halls of the last 20 years are generally erring on the side of sticking out; they impose what you might call a spaceship type of construction and plop it down in human settlements. These institutions are hoping such venues will command great attention and generate interest because of a piece of architectural sculpture. AG: The French philosopher Charles Péguy said Homer is new and fresh every day. Read The Odyssey or The Iliad; it’s never old. What is old is the latest newspaper. The problem of these buildings that draw attention to themselves is that nothing ever happens in them to justify that amount of attention. There’s always a dialogue between the people who use the building and what goes on in the building. There are some buildings that are quite laid back. Think of Rockefeller Center in New York. That’s a commercial building, a complex of offices, yet the space in it has been designated by generations of New Yorkers as the single major civics space in the city. That’s where the big Christmas tree goes and so on. It’s a very laid-back space. So I think it’s better to err on the side of modesty and focus on producing quality activities inside the opera house, rather than creating this strange spaceship and having mediocre performances in it. AB: They would argue that you don’t have to make a choice between either. You can have superior performances in an outlandish concert hall. As we speak, this very week, the Hamburg Elbe Philharmonie is celebrating its opening. Have you had a chance to look at that hall? AG: No, but I’m thinking that the one example of a concert hall that stands out and that actually works is in Los Angeles, Frank Gehry’s building. I heard Dudamel, who I think is an interesting conductor, there. The acoustics are wonderful. But downtown Los Angeles is the most barren, empty, unappealing space in the entire city, devoid of any character, until you stumble on this crazy efflorescence of human imagination in the middle of the city. It’s like the largest sculpture ever built. But the inside of the concert hall is quite laid back. It uses vineyard seating, which was invented by a German, Hans Scharoun. I’ve been inside the Elbphilharmonie, heard only a small part of a concert. I can’t say I spent enough time in that hall to form an opinion of it. The outside is a little disappointing. But Gehry’s building is his masterpiece, because it has this dialogue with this dreary city: “Guys! Life has more to offer! Look at me!” But they both are lucky, they’ve got a good orchestra and a good conductor, at least when they have him. I think it all depends on context, but I think ultimately the continuity is more important, and there are very few situations – certainly Rice is not one of them – where the spaceship would be comprehensible, would have a point. AB: Our organization, Future Symphony Institute, is more concerned with smaller communities. We know that New York and Los Angeles will be fine; they’ll figure it out, regardless. But when you look at these smaller towns that become larger cities and can now sustain an orchestra – an opera company might be a stretch – they plan on spending $150–200 million on a new concert hall. What happens if they look to Los Angeles? AG: A mistake, yes. I mentioned this at one of my interviews, maybe with the music school. I believe the great opportunities the little opera house offers is to the school system of Houston. I think music should be a major component of high school education because of the mind’s development that listening to music requires and that happens as you listen to music. I think that the imaginative component, the fantasy component in opera, is also desperately needed in this sad world we’re building for ourselves. I think all these little communities are a place for the rebirth of opera. The past and the present in opera can have a rebirth, but I think the key is little concert halls, little opera houses which feed the community. The high school orchestra may not be the New York Philharmonic, but it doesn’t matter. AB: One of the things we’re most concerned with is the envy or inferiority complex that makes smaller places, when they look at what’s going on in the big cities, think they have to replicate something really large. My hometown of Madison, Wisconsin, for example, has a 2,250-seat hall. Of course, it’s rarely full. It didn’t need to be more than 1,200 seats. That would have been plenty for our town. Then we’d have full houses. AG: Better small and full and a long queue of people waiting to get in. AB: Initially planners think more seats, more money, but it never works out that way. The cost of running this huge building is crushing. I’ve always felt that traditional architecture offered the possibility of a more cost-efficient home for a symphony orchestra. Ultimately they’re cheaper to run, they don’t require these giant machines. What happens is that we think people will relate to us more if we build a spaceship than if we build a Boston Symphony Hall, which would be pretty easy to build. AG: I think you can sacrifice a lot of the electronics for a good basic hall and focus on the musicians and the music teachers and the connection to the community, because you want your audience to come from around the place, not from far away. Opera in New York is too expensive to be a local experience. New York has become a ghetto with a golden key. It does have local people going there but nobody else can afford it. There are no ordinary people left living in New York, just the very wealthy. Young people live like sardines in an expensive apartment in order to pay their rent. AB: You’re touching on a sore spot for classical music and that is these widening gaps of economic classics. What can the role of architecture, of the concert halls, be? Your hall sounds very inviting, but what can we do in terms of architecture? Generally speaking, the concert hall’s foyer is something we’re very interesting in. What can we do in terms of design that will make people feel much more welcome and comfortable in an environment that’s meant to take them into another world, generally a world of the past? AG: It can be a much more elementary version of that, a much simpler version. I know most little towns probably want a 500-seat auditorium. I’m a big proponent of music and art as part of a learning curriculum – art, with the imagination, and music with its connections to mathematics, to emotions, and voice. I think that’s really the key. AB: Putting it back together. We’ve broken off into specializations so early in life. Traditional knowledge was a oneness: an architectural side, a musical side, a linguistic side, a rhetorical side, all in one body of knowledge. That’s certainly fragmented now. AG: I lived for a while in Paris and Copenhagen, and I don’t know why we impose four years of college on students in the United States. Growing up in South Africa, I graduated at sixteen, going on seventeen, and I went straight into architecture school. When I was twenty-one and a half, I was finished with education. I got a job and earned my own living ever since. AB: I’ll tell you why: during the Clinton years they pointed out that the outcome for people who’d gone to college was better than for people who didn’t go to college, therefore everyone ought best go to college. AG: Outcomes in the United States where everybody goes to college, but the outcomes compared to England, Canada, Australia – I don’t know. If you go into medicine, and you specialize, you’re a student until you’re in your thirties. Why should somebody who’s going to play violin in an orchestra go to college for four years, although he or she will be studying violin? AB: It’s vocational training, and they sweeten the deal by giving you a bachelor’s degree. We musicians criticize conservatories as trade schools, as if having a vocation is a lowlier calling than attending a university. It’s entirely fair to have vocational schools. Vocational training is highly desirable, especially since most everyone seems to want to enter a vocation when they graduate. AG: Mozart never went to school, he didn’t study composition, had no degree from any institution. AB: He went into the family business. His father taught him. If his father been a tailor, he’d have taught him to be a tailor. AG: The same is true of the architects who built the ancient temples in Greece and Rome. Michelangelo was a stonemason; Andrea Palladio was a plasterer. All the greatest architects in the world started life as a tradesperson, or in the nineteenth century working in an architect’s office and learning the trade there through an apprenticeship system. I don’t see what’s wrong with that. The four-year B.A. is just a question of snobbery. I had an experience with a building project in London, which in the end never happened, but I had an office here and I wanted to open a little office in London. I could send people there and do whatever we had to do and come back, but I didn’t want to be double-taxed. So I went to a big Washington law firm, surrounded by Ivy League lawyers, specialists in international taxation, and I outlined my problem. I never heard from them. Three months later I was in England complaining to an American architect there. He said, “Allan, you’re wasting your time. Go and see this law firm in England,” and wrote down the name and address. I had an appointment the next day. And when I got there, a partner and his assistant listened to me and said, “This is easy. We’ll deliver a letter to your hotel tomorrow morning and that’ll tell you what to do.” So I got this one-page letter pushed under my hotel door at seven thirty in the morning, and it said, “All you have to do is have your people in this office space you’re renting move their desks at least an inch every twenty-nine days so you’re not permanently anywhere. They can swap desks, so they’re in a state of flux.” This worked perfectly. I called the American law firm and said, “What should I do?” and they said, “We’ve been collecting case studies and we’ll send them to you.” I got this pile of paper and I said, “Frances, I’m not a lawyer. It’s your job to read through this crap and tell me what you think and what I should do. I got your bill for $15,000 and I’m not paying it.” I wrote her a letter that said, “See the attached. This is why I’m not paying you,” and I enclosed the English law firm’s letter and the bill for 500 pounds, which was outrageous for half an hour’s work, but it didn’t have the element of craziness, for nothing, just copying. That was the end of it. I never heard from them again. Two lawyers in London, big office, went from high school to law school, and they were much better lawyers than the Americans. They could even think clearer. AB: They were going straight for a solution rather than a process that they could bill you for. AG: I’m a big fan of the apprenticeship, going from getting into your professional realm as soon as possible. AB: That’s the way I did it. AG: You’ve got lots of rivals in the jazz world. AB: They’re welcome to it. I love playing symphonic music. I’m playing Beethoven’s Seventh tonight at Strathmore. That’s heaven for me. AG: There are trumpet concertos. AB: It all started with the Second Brandenburg Concerto, which is treacherously high. Bach’s Christmas oratorio and the B minor Mass have tremendous trumpet parts. Other composers shortly after Bach were writing these clarino parts, very high. All the harmonics at the top of the register were close together so you could play scales. There were hundreds of these Baroque concerti. They were always up and down the scale, so there were limits, but there were some that were quite beautiful. Haydn wrote a tremendous concerto for the very first chromatic trumpet, a very clumsy keyed bugel. Hummel wrote one right after that. Then we had a long drought through the Romantic era. Composers had us play fantastic parts in the orchestra but nothing in front of the orchestra as a soloist. We only developed because of the cornet playing in bandstands of America. That tradition is tremendously vast but it’s always a very simple theme, with increasingly more complicated variations. The cornetists were among the higher-paid musicians of the nineteenth century. They were like prize fighters. You’d go to see dueling cornetists in the park. AG: Like black college bands where they have dueling drummers. AB: Right, it was more of an athletic event. And there was often an athletic aspect to opera where performances were treated more like a sports competition. I like that part of music too: trying to outdo each other. That’s a big part of jazz, but jazz is nearly dead. It’s largely thanks to the efforts of Saint Wynton Marsalis that it’s not. He deserves to be canonized. If it wasn’t for him, I don’t know if the rest of them could have held on. It’s been utterly abandoned by the population that birthed it. The only stable job there is to be had is at Lincoln Center and state-funded European big bands such as Runfunk houses. Jazz at Lincoln Center has that beautiful Rose Auditorium. Musicians do very well there, or well enough, but I don’t know any other place, except France for example, which will pay jazz musicians just to exist. If they have a lean month, they’ll get a stipend. AG: Honky jazz has never been much. I don’t think jazz is white man’s fodder. African rhythms you get in your mother’s milk. I think of people like Dave Brubeck. But if you listen to white rock ’n’ roll, the beat is like a metronome, whereas black music, the rhythm is never stable. That’s why it’s alive. Its demise is beyond belief. AB: It speaks of many things. There are tremendous lessons to be mined from such a great art form that was born here and should have kept going but somehow didn’t. AG: It’s not much different from classical architecture. In the 1930s, when a lot of German refugees came here and brought the idea of a socialist architecture with them, Harvard appointed Walter Gropius as dean of the architecture school. Harvard started propagating modern architecture. It’s odd that this architecture, which was the vehicle of the trade unions in Europe – it was the driving force to create decent housing for workers – was adopted by the millionaire class in the United States, by the Rockefellers at MOMA. The course of architecture was totally changed. AB: I feel strongly that classical music as a performance culture, when we know that most of what we do is play old music, will be better off playing within the walls of traditional architecture. AG: Are there any great or really interesting and good classical composers today? AB: Yes, there are. The problem is that we’re in the midst of a cold war between performers and composers. We don’t trust composers, and audiences definitely don’t trust new music. There are very small audiences for something new. Most experienced concert goers are afraid they’re going to be tortured, on principle. We taught them they would be tortured by torturing them. It’s not that people can’t compose, and the few good composers there are write beautiful music for the sake of itself. Some of them found employment in Hollywood. Great composition lives on in films. That’s where the money is right now. Erich Korngold came from Europe and did great film scores. But many of the others who are writing nice tonal music, which is the analog to traditional architecture, are quite beaten down – beaten with the “originality” or “innovation” stick. They’re told their music is derivative, not innovative or original. It gives them nervous tics because they’re just writing from their hearts. Nobody pays them for it. We don’t have a good royalty system in place. AG: My son-in-law is a musician. He used to teach at USC in Los Angeles; now he teaches part-time at San Francisco Conservatory. He plays just about any instrument. He makes his living writing music for video games. They don’t pay that well. He works really hard and gets small music jobs for movies. He used to do a fair amount of work for George Lucas, so I know how hard it is to find an outlet for your energy. AB: That’s where classical music is now. It’s doing very well, but it could do better. I think getting the architecture right would go a long way to build support for our art form. Certainly during that forty-year period after the war they built too many horrible concert halls – even Avery Fisher Hall is a wreck. Los Angeles, before they got their masterpiece, had Dorothy Chandler auditorium, which was awful. The list goes on, and this is a weight that holds down the art form. AG: I know this business of torture. I was invited by a friend to Lincoln Center to the Chamber Music Society. We went and had a really nice time, but after the intermission, they have to insert some new piece of music that they had just commissioned which was unlistenable. It was really an insult to this audience. However long it was, it was too long. I sat through it and tried to find what this piece of music was supposed to be about. I have a high tolerance for discomfort. I sit listening to public radio in the afternoon to these musicians who repeat the same tone again and again – repetitive – and all of this other music, but this I couldn’t deal with and I never went back. The fact that the musicians or the organizers of this concert felt that they had a moral duty to give new music an audience without asking whether it’s worth finding an audience for this music in the first place I took as a major insult. It’s as if they didn’t think very much of their audience. They didn’t think the audience had the capacity to choose so they chose for them. Mozart wrote a concerto for French horn. I heard a French hornist at Rice University play it. It was astounding. It’s not an easy instrument, not a lovable instrument, but it was beautiful, just extraordinary. But you’ve got to respect your audience, and the Chamber Music Society doesn’t. They think their job is not to provide musical enjoyment for the audiences but to educate them, and that’s guaranteed to lose your audience. AB: Do you find that’s true in the architecture community? AG: Yes. They’re always coming out with new buildings, and it’s always the stupidity of the public that is to blame for the fact that nobody loves them. AB: That’s my point about concert halls, that it’s life or death for orchestras when we go so far out on a limb for a concert hall that’s meant to be the capstone for the career of a particular architect, really just a huge statement. The hall isn’t meant for people. It’s a conceptual work of art meant to be talked about in magazines or garner industry awards. AG: Same in architecture. I have a question. What is the difference between a good eighteenth-century opera and a musical, like Porgy and Bess or Oklahoma!, which has a story – it’s an opera really. What’s the difference? Quality of music? AB: It’s the line between beauty and kitsch. AB: That’s a very good question. For some people it could be kitsch. It gets close to kitsch, it runs along the fence to kitsch, it reaches over the fence. I like Oklahoma! and I certainly don’t begrudge anyone liking Oklahoma! but it’s not Lehar’s Merry Widow, to compare to something light. Merry Widow is arguably superior to it. You’ll discover the difference in the craft, in the orchestra parts, in the quality of melodies, even when plots are comical. It’s the phenomenon of McMansions. They’re using the same language as traditional architecture except the proportions are all off. Crappy renderings, sort of grotesque, most definitely kitsch. It strikes your eye immediately as kitsch. I go bike riding a lot through the Maryland countryside and see beautiful old estates; some are just beautiful, simple farmhouses. These were not highfalutin people, but they built a nice home. Then there’ll be a similar home built ten years ago by a developer, and it just hurts the eyes. Even though I’m an armchair architect, it’ll be so kitschy and abhorrent to me, I have to ask myself, why? It has columns, windows, shutters, a gabled roof. Why doesn’t it work? That’s the same problem with Broadway. It mimics the real thing but it takes so many shortcuts and often pushes things too far in terms of what it’s asking of the listener. It says, you have to feel this now. They tend to overstate their cases. Also, in opera the message is, these feelings really matter. In Broadway musicals, it’s more like none of this matters. It’s sort of nihilistic. We’re laughing at drama itself, pain itself. It’s important to learn to laugh. We can laugh at ourselves and laugh at life, but these things do matter. AG: I think you make a lot of sense, but I think there’s a place for light opera. AB: You think of Franz Lehar, or Fledermaus, which is hysterical. The craftsmanship of Fledermaus is incredible. Or look at Richard Strauss’s Ariadne auf Naxos, which is very funny. AG: What about Rosenkavalier? That does verge on farce. Is that an operetta or an opera? AG: Movies bridge that gap better than music. There’s a series of fabulous comedies, remarriage comedies. Marriage of Figaro is really a remarriage, because the count reconciles with the contessa. I’m thinking of movies like Bringing Up Baby, Monkey Business. There’s a professor of philosophy at Harvard who’s written a book about these movies. If I can remember it I’ll send it to you. I think you’d really like it. AB: Do you know Roger Scruton? He’s a Senior Fellow for our organization. AG: Yes. He’s a really smart man. AG: What do you think of this? My daughter and I are always sending each other pieces of music. (plays Susannah McCorkle singing “The Waters of March”) The lady who’s singing it died quite young. Her name is Susannah McCorkle. The guitarist is Brazilian. AB: Notice how she’s using her voice. She’s on the edge of talking, then falls into a bit of a song. AG: The rhythm is a samba. She somehow uses her voice to pick up that rhythm. AB: It’s wonderful to be able to explore these things, discover all the feelings. That’s the wonderful thing about music. We discover ourselves. Thank you for an illuminating conversation. I am a Rice architecture grad and I am looking forward to attending a performance in the new opera house. A couple of questions. Did Greenberg have any influence on the location of the hall or was that a given before he was interviewed? (Thanks for a glimpse into the palace intrigue over the ultimate selection of the design architect.) The building– an object behind a wall, with a semi-circular road– seems to be an effective way to terminate one of the grandest axes of any university in the world (although Fondren Library should have been torn down as Venturi recommended). However, Rice’s cross axes are just as important and only the first one, leading to the engineering quad, has been protected. The one terminated by Hamman Hall has been maintained largely through the landscaping that begins near S. Main St. Did Greenberg do any work on a possible new cross-axis between Bofill’s Sheperd School and the opera house? The greatest overall damage to Cram’s plan has been done in the last 15 years and is continuing, as shown by the new social science building that fails to reinforce a rather weak new cross-axis that will be terminated rather poorly in the side of the business school– Any thoughts?